We have made Broadway World’s list of “Must Read Theater Books”. Click on the link and scroll down. We are number six!! In the fall of 1967, with the war in Vietnam raging, a large scale antiwar demonstration was organized at the Pentagon. 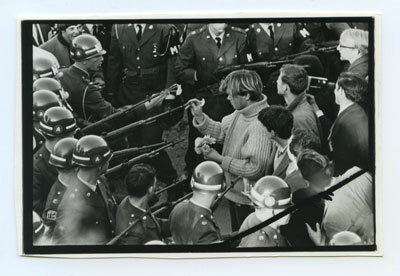 Many photojournalists were on hand, including Bernie Boston, who took a photo of my brother, George Harris III, age 18, inserting flowers into the rifle barrels of National Guard soldiers in a tense confrontation. Boston’s iconic image of my brother George, answering guns with flowers, remains a metaphor for the message of the 1960s youth counterculture movement – that love can overcome political tyranny, unite the human family, break the war machine, and bring peace to the world. Three months later, at age 16, I was cast in the rock musical HAIR as it was preparing to open on Broadway. HAIR has a reputation as a “hippie musical” but, in fact, it was (and is) a powerful anti-war statement. The show was an overnight sensation, broadcasting the hopes and dreams of the youth counterculture, and an earnest plea to end the war. Boys from my New York City neighborhood were drafted, went to Vietnam and returned injured, or never came back. Inspired by my brother meeting guns with flowers, I poured my whole self into making my performance in HAIR a deeply personal statement against the Vietnam War. I believe the show’s many first-run productions around the world played a part in ending the war. In modern HAIR productions my brother’s courageous act of protest is reenacted. 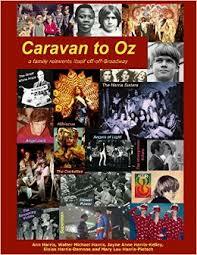 Our full story is in the new memoir, Caravan to Oz: a family reinvents itself off-off-Broadway.